London Roots Research: Have you found Dickens connections in your family tree? Have you found Dickens connections in your family tree? As we celebrate the 200th anniversary of Charles Dickens' birthday today, 7th February 2012, I am reminded of the period of his lifetime, 1812-1870, when my own ancestors were living in London and have been pondering how their own lives must have been during this period. Did any of them brush up against this famous author, I wonder, or even provide inspiration for some of his characters? 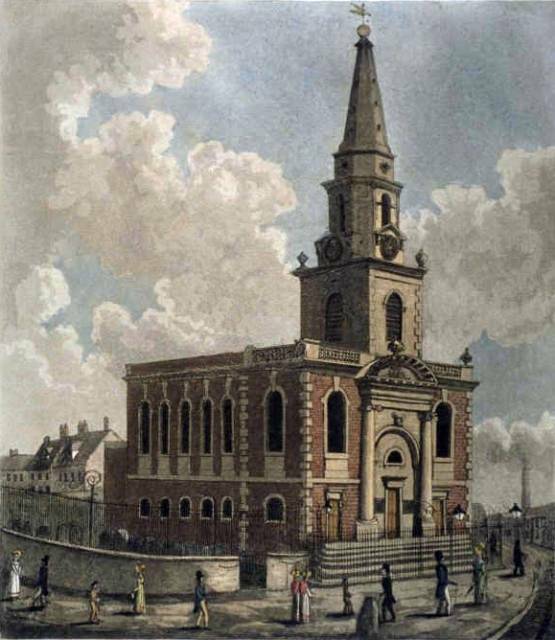 My own gg grandfather Edward Clifford, whom I wrote about in an earlier post, was baptised at St George the Martyr in 1799, along with his sister Charlotte. 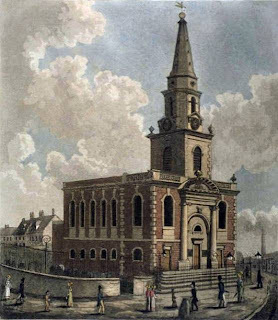 Charlotte also went on to marry her husband John Rafter in 1824 in the same church. These baptism and marriage records can be found either at the London Metropolitan Archives or online on Ancestry's specialist LMA parish register collection. According to newspaper reports, I also have various ancestors who seem to have been in and out of the debtors' prisons of south and east London, including the Marshalsea, where Charles' father, John and the rest of the family found themselves living for a period in 1824. So did they met there I wonder? 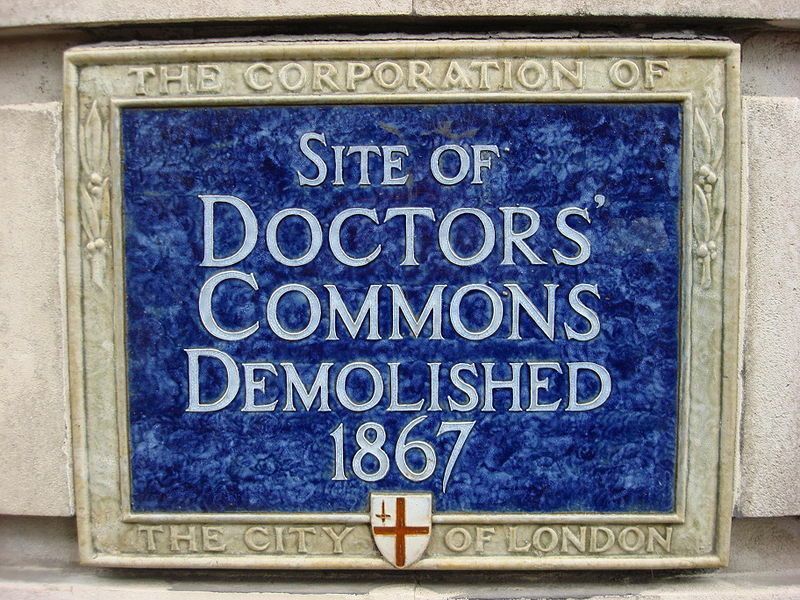 In 1828 / 29, Dickens worked as a reporter for Doctors' Commons, in Knightrider Street. Doctors Commons, also called the College of Civilians, was a group of lawyers practising civil law in London. It was also the home of the ecclesiastical and admiralty courts which had jurisdiction over marriage licences, divorces and registration of wills, until it was replaced by the Court of Probate Act in 1857. The building was then demolished in 1867, and these days its original location is marked by a blue plaque, which can be found on the Faraday Building, on the north side of Queen Victoria Street. My own ancestors, Charlotte and John Rafter, registered the death of her late father, Charles Clifford, for death duty purposes, in 1841, giving her address as 21 1/2 Lambeth Hill, Doctors Commons, London. So this is another link between Dickens and my Clifford family. In 1861 Charles is found living at 3 Hanover Terrace, St Marylebone, Middlesex, with three of his children and his wife's sister, Georgina Hogarth who was his housekeeper. I am now off to see how close my Londoners lived to these addresses - I must admit they all sound very familiar! Have you found any connections to Charles Dickens in your family tree? Very interesting Rosemary - it sounds like your ancestors may well have brushed shoulders with the great man at some point! I am very envious! I like to think that my ancestors, like many others, waited impatiently for the next installments of his novels as they came out in Household Words - but I would certainly love to have a more closer connection. Mind you, my great-grandfather did play cricket with W.G. Grace, so at least I have one good historical name-drop! Thank you for your comments Ros. I must admit I have only recently discovered the close connections and of course I would love to know more. But sadly we can't go back in time. Thank you for your post Rosemary. I like to think my ancestors, the White family might have passed Charles in the street of Broadstairs, Kent during his holidays there. Thank you for commenting Merron. How interesting that you have two separate links to the Dickens family. The Australia connection is certainly a long way from London! I'm preparing, with some trepidation, a presentation to the British Isles Family History Society of Greater Ottawa which will include my family's claim to a Dickens connection. Charles Dickens started the Daily News in 1846 as a radical/liberal alternative to the more conservative papers of the time. He passed on the editorship to Forster after about ten weeks, when he found the duties too heavy an addition to his already packed schedule. There is a family story that Dickens came to visit my great-great-grandfather in the 1860s and that my great-grandfather was hiding under the table from his mother (my gg-grandmother) when he got a gentle kick from Charles Dickens, warning him she was coming! Can't yet prove this charming tale, but I do have documents proving that William King Hales was the publisher of The Daily News. Good luck with your presentation Gail. It sounds like you have a pretty good story to talk to them about. I'd be interested in hearing more about this connection - a shame that Ottawa isn't exactly just around the corner from me! I have been contacted by a descendant of William Hales, who would like to get in touch with you in order to share family history research. 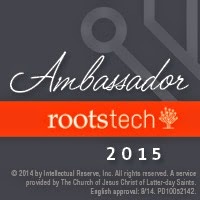 If you contact me personally on londonrootsresearch@gmail.com I will put you in touch with him. I'm from the US and my last name is Dickens. Charles is a documented 2nd cousin to the family -- and in 1853 some family members went back to England and named their newborn child after him in a ceremony that the Author attended. Charles signed a book and inscribed in it to that effect, which is kept in the family. We have another book that the author signed to my own g-g-g-great grandfather, Christopher, while in the US. Apparently they met during a US tour. In my generation, my direct uncle is also named Charles -- and amazingly they look very close in appearance. Uncle Charley has been married a few times, finding love in every corner he turns, and has about 9 children. He's been invited to Christmas diner at the Governors mansion on occasion, because of the name. What a lovely story, Anonymous. 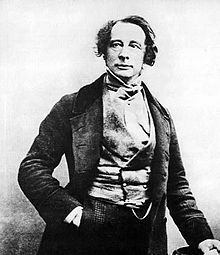 I hope that you are enjoying this year of Charles Dickens' anniversary - with all the events happening, to remind you of your ancestors. I'm glad you like this post, and apologies for the slow reply, I've been very distracted from blogging by client research, but I hope to write a new post soon. You're welcome Scott. I am continually reminded of the Dickens link in my family. Only yesterday I was looking for my ancestor, Charles Clifford, in the records of prison hulk ships (at the UK National Archives), which aslo feature in Dickens' novels. I hope to write a new blog post about this soon. I'm related to a Newnham family from Chatham Kent who lived close to the Dickens family - I know that there was an old Mrs Newnham who figured in Dickens' childhood and would love to discover that she was one of our family. How exciting to think you might be related to the Mrs Newnham who figured in Dicken's childhood. I suppose we would need to be able to identify this Mrs Newnham correctly in the records first. Have you thought of contacting Dickens descendant, Lucinda Hawksley, to see if she might be able to help? Feel free to email me if you'd like further information. I wrote about the Newnhams in my book "Charles Dickens' Childhood", now nearly 25 years old and out of print - your local library should be able to obtain a copy for you. In his will Richard Newnham left a small sum of money to one of Dickens' sisters, Letitia. I have a copy of that will, if you're interested. Dickens' father borrowed money from Richard Newnham, part of the debt that landed the Dickens family in the Marshalsea Prison. It would appear that the Dickens family kept in touch with Mrs Newnham, at least through to when Dickens married in 1836. I'd be interested to know how your family see the connection. Thank you for your comment, Michael. I have sent a message (via Twitter) to the previous poster, "we came from" so we'll see if she can add any more information about the Newnham family. I did not expect this. This is a excellent story. Thanks! You completed a few nice points there. London Roots Research: Copyright Rosemary Morgan 2010-2012. Picture Window theme. Powered by Blogger.